Parking lot Sealing, Frederick, Md. First impressions are very important. Your parking lot is the gateway to your business. All visitors, employees and customers pass through here on the way in and once again on the way back out again. This first impression is very important to the overall feeling and atmosphere conveyed. dollars by prolonging the life of the pavement surface. Sealcoating costs pennies a square foot, compared to the many dollars a square foot to replace the surface. At Fogle’s we will work around your schedule to minimize any disruption to your business. 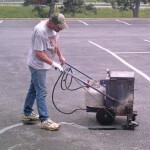 If you need your parking lot sealed, or if you just want the cracks repaired, please give Fogle’s a call. 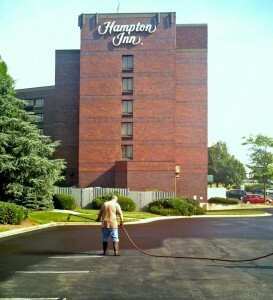 If you have cracks, we can apply hot-melt crack filler to major asphalt separations and cracks prior to Sealcoating.